..it looks pretty damn good! Penguin have surprised me by sending me a gorgeous copy of Emily Mckay's The Farm. And it looks fun enough to make me temporarily suspend my ban on books with hooded figures on the cover. Because it's a red hood. On a girl. So it's OK.
"Life was different in the Before: before vampires began devouring humans in a swarm across America; before the surviving young people were rounded up and quarantined. These days, we know what those quarantines are—holding pens where human blood is turned into more food for the undead monsters, known as Ticks. 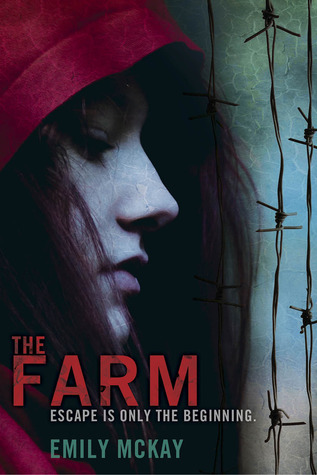 Surrounded by electrical fences, most kids try to survive the Farms by turning on each other… And when trust is a thing of the past, escape is nearly impossible. Lily and her twin sister Mel have a plan. Though Mel can barely communicate, her autism helps her notice things no one else notices—like the portion of electrical fence that gets turned off every night. Getting across won’t be easy, but as Lily gathers what they need to escape, a familiar face appears out of nowhere, offering to help… Carter was a schoolmate of Lily’s in the Before. Managing to evade capture until now, he has valuable knowledge of the outside world. But like everyone on the Farm, Carter has his own agenda, and he knows that behind the Ticks is an even more dangerous threat to the human race..."